Here at Four Seasons Property Management, we only manage properties at Lake of the Ozark's and have been doing so since 2003, so, you could say we know the lake pretty well! 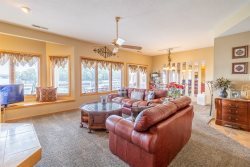 We understand what makes a good vacation rental, we understand what guests are looking for in their home away from home, we know the most beneficial booking windows for maximum occupancy all year long and we love Lake of the Ozarks! This winning combination is what sets us apart from the rest and only part of the reason why you should consider Four Seasons for your property management services. We make it our business to find vacation rentals of the highest standard that go above and beyond our guest's expectations. By providing the finest in vacation rentals we can ensure that our guest's vacation is a success no matter which property they decide to stay in! In the business for 15+ years, we know what it takes to run a successful vacation rental management company. Managing all guest and owner interactions and communication, Four Seasons Property Management is hands on! Offering property owners a hassle-free low-cost option as a full-service property management company. We manage everything from taking listing pictures of your property, making reservations and completing customer service throughout the guests stay in your home. Additionally, we provide monthly accounting statements of which owners have complete access to through our website including the capability of making owner reservations for your own use! The quality homes in our inventory are cleaned by trained professional and we provide quality customer and concierge services, these are what sets us apart from the rest. Whether you are renting with us or putting your rental in our hands as an owner you can be sure that you working with the best in the area! We cherish our relationship with our owners realizing we need you more than you need us! We take pride in the properties we manage and allow you the owner to be as involved as you wish. All maintenance issues are performed with your direction, we will coordinate, organize and oversee again, with your direction. Bottom line, we will not nickel and dime your revenue bottom line. As you can see if you are a Lake of the Ozarks property owner Four Seasons Property Management has you covered regardless of your exact property management needs! We would love the opportunity to visit with you regarding your lake property and ultimately partner with you to generate revenue and to make your lake experience enjoyable.